The Vent-A-Hood Professional Wall-Mount Range Hood with linear styling accents professional-style appliances. 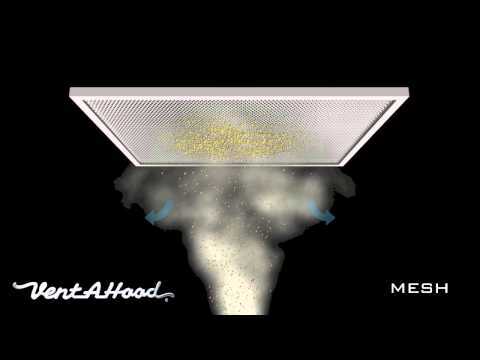 The 27-inch deep active canopy is able to collect grease and contaminants more efficiently than normal vent hoods. The Magic Lung system is designed to capture 99 percent of cooking grease, steam, and odors 100 percent of the time, all the while at 6. 5 sones, being quieter than competitors ventilation systems. The grease collection system snaps apart for easy cleaning and is dishwasher safe for quick maintenance. With no baffles or screens to impede air flow, not only is the hood more efficient, it is engineered to prevent grease and fire from accumulating in the hood duct-work, and SensaSource monitors cooking activity and will increase the blower speed. The 600 CFM blower is controlled with two-speed rocker-type control and delivers the equivalent of 900 CFMs, while the LED lights feature two-level dimming. All Vent-A-Hood products are suitable for outdoor use, such as a covered patio, when installed using a GFCI protected circuit. You may customize this Vent-A-Hood hood with optional warming lights, or a barbecue extension for use outdoors. This vent has an 8-inch discharge outlet.